Depicts an outdoor Chinese Shrine. The translation of the second row of signs is written "Kung Hay Fat Choi". In an article, January 28, 2006, B1, The Province, they list this as Gung Hay Fat Choi, meaning "Happy New Year". 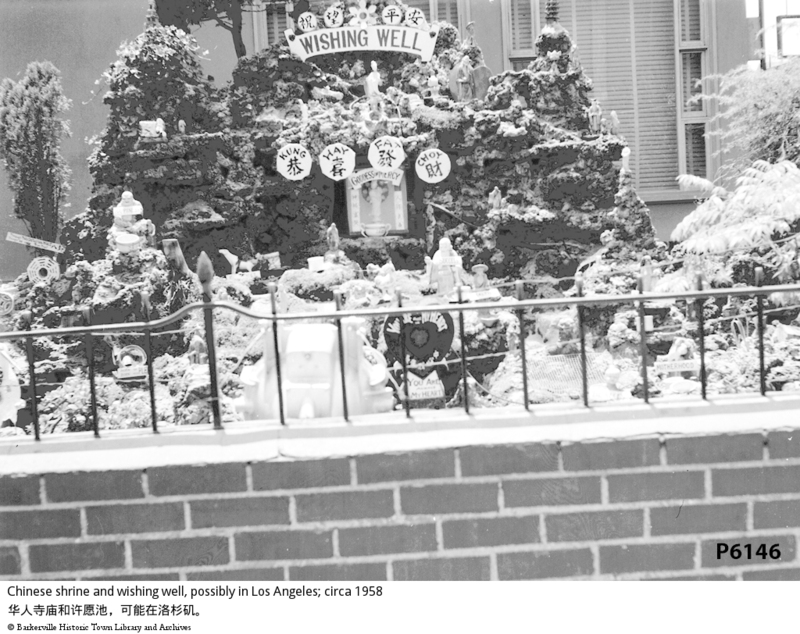 The text above, in the Hoy photograph, may translate "Welcome Spring Receive Good Fortune". This shrine has a Goddess at the centre which is indicated in English to be the Goddess of Mercy. There are other characters such as the man with the peach in his hand and (to the right) the Fisherman (statue with the conical hat), both traditional symbols. Translation by Nan Zhu, 2012: Wishing Well (top) Happy New Year (bottom).